Queen of the Nile Aristocrat Pokies is by far one of the most well known around the world. Australian pokies really took off around the time this game was released with the flash Egyptian symbols including Cleopatra (WILD), Pyramids (SCATTER), Pharaohs, Scarab and Egyptian symbols. 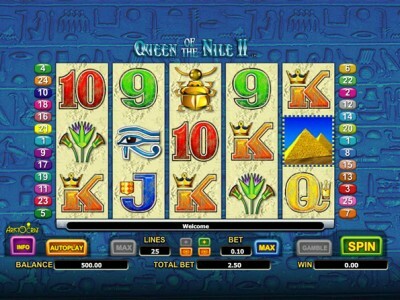 This Queen of the Nile slot can now be played for free and you can enjoy all that the game has to offer without depositing any real money. You can pay between 1 to 25 paylines and symbols pay left to right. 3 or more of the scattered PYRAMID scatters triggers the free games feature, select between the following..
Aristocrat pokies including Queen of the Nile features a gamble feature where you can easily multiply your winnings. There is little wonder why Queen of The Nile is the number 1 Australian pokie. Recently this game has been added to Vegas casino halls, with many new American players. Have a play on our demo game by clicking the link above.